There are several species of carpenter ants. 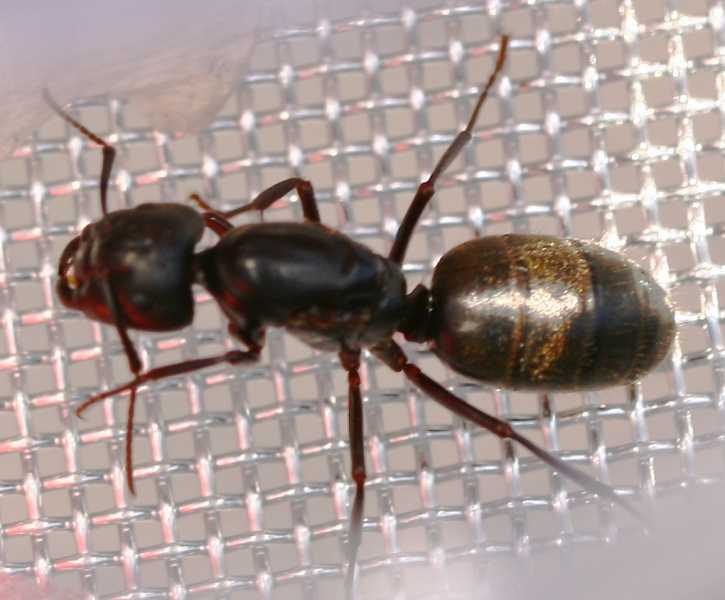 They can be black, brown or red, and workers vary in size from 1/8 to 5/8 inch. They are divided into castes which include queens, workers and males. Queens (one per colony) are the largest of the group, up to one inch in size; next in size are major workers (female), males, and minor workers (female). Carpenter ants are distinguished by having a waist with one node or pedicel, a thorax with a rounded upper surface, bent antennae, and if wings are present the back wings are smaller than the front wings. They are differentiated from termites in that termites are light colored, do not have a waist constriction, have straight antennae, and if wings are present they are of equal length. The presence of large, dark, wingless ants inside the house is a good indication of an infestation of carpenter ants. The number of individuals generally indicates whether a nest is located inside or outside of the house. A few ants probably mean that the ants are foraging and may have entered the house looking for food. If large numbers are present, it means a nest is inside the house. The parent nest is generally in damp wood, dead branches or a wood pile close to the house. There also may be satellite nests. The key to control is to follow the trail from the house to the parent nest. Successful removal of carpenter ants depends on finding and destroying the parent nest. 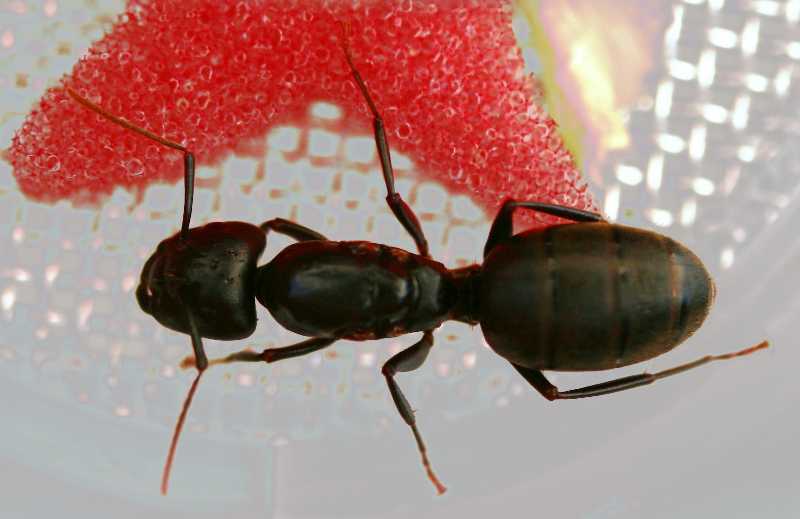 Carpenter ants undergo complete metamorphosis. They pass through egg, larva, pupa and adult stages. The sequence takes about 60 days. A typical nest contains one queen, sterile wingless female workers, legless larvae and at certain times winged females and males. The queen’s primary function is to lay eggs. After about six years when the nest has approximately 2000 workers, winged males and females are produced. Winged swarming ants are in the reproductive phase. After mating, males die and young queens establish new colonies. Diet consists of living and dead insects, honeydew excretions from aphids, nectar from plants, sweets, meat and fats. They do not eat wood. Carpenter ants will forage several hundred feet from the parent nest, mostly at night. Workers do not eat solids, only liquids. Workers ingest liquids and regurgitate to feed others in the colony. They carry solids to the nest and feed the solids to larvae. Larvae eat both liquids and solids. Larvae process solid food and regurgitate it back to adult ants in liquid form. 1. Find the parent nest. The key to controlling carpenter ants is to find and destroy the parent nest. This requires following the ants from the house to the parent nest. 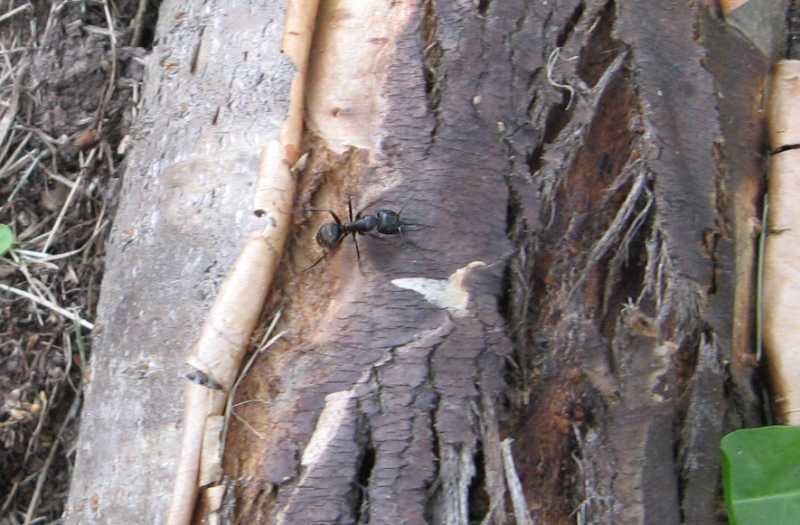 Carpenter ants follow scent trails. With some time and patience you can discover the scent trails and subsequently locate the parent nest. Often baits will attract ants that can be followed from the house to the parent nest. Baits can include honey and water packed tuna. 2. Treat the nest. If the parent nest is found it can be sprayed or drenched with an insecticide such as carbaryl (Sevin) or other insecticides specifically labeled as effective against ants. Follow label directions. Since carpenter ants can travel along wires and pipe, liquid sprays should never be used around electrical outlets. Inside the house boric acid powder can be puffed into small holes drilled into walls/areas where the ants are suspected to be located. The use of granules outside is generally less effective than spraying the house foundation and areas leading to the parent nest. Control may best be done by professionals. 3. Prevention. Eliminate all leaks and moisture problems. Repair/replace all damaged, wet wood around doors, windows, and siding close to the ground. Remove all wood close to the house—railroad ties, firewood, decorative wood chips, dead trees and branches. Remove all tree limbs that overhang or touch the house. Seal around any opening in the foundation, water lines, electrical wires and vents. Caulk all foundation cracks. For a strictly organic approach to Strategy 1, use appropriate organic bait, such as honey and water. Strategy 3 is a strictly organic approach.